The inauguration of ANNO 2155 had proved a most painful spectacle to the freedom fighters. Dr. Nilsson had valiantly tried to stop it but failed. Since then the World Union had became a reality, with all nations reduced to provinces and two world-capitals at London and New York City (though Dr. Chillingsworth preferred the former metropolis as his residence and did most of his business there). The day after the installation at Versailles World Union police swarmed everywhere, distinctive in green uniforms and carrying thought-weapons. People began disappearing, a sign for those who could see it, that world-wide surveillance systems were also operating. With all the details worked out in advance, the changeover was completed in a matter of weeks. Sovereign power shifted from each country to Dr. Chillingsworth’s super government. He assumed responsibility for providing the world’s unified army, air force, tax collection, World Union mint and coinage, official seal and logo, all other features of government, to the point provincial authorities were left with very little to do. It was so fast and absolute nothing was said in opposition, though he could not have been a mere “world premier” as officially stated while exercising absolute power. Technology seemed to benefit most from the changeover, both on the planet and off. Massive pubic works of all kinds were announced. The world premier appeared almost nightly on world video, explaining the improvements in a series of informal, American-style “fireside chats.” With all the world’s combined scientific and industrial resources harnessed to achieve certain projects, he soon had one astounding break-through after another to report. In just a few years the world was transformed with utterly new modes of transportation for intercontinental, continental, and urban travel. Then, aiming to provide Earth with unlimited energy and chemicals, he inaugurated a series of gas-solidification planets to utilize the boundless resources of planets like Jupiter and Uranus. It truly seemed that Chillingsworth had saved the world from decline due to the ever-worsening world climate, and one “province” after another rose to load him with honors for his achievements. The greatest honor of all, of course, was still the Nobel Awards, five in number. It was inevitable that they be given Dr. Chillingsworth for what he accomplished during his first term as world premier. With his colossal first synchronous gas plant set in place over Jupiter, the awards could may be withheld without creating a tremendous scandal Nilsson and the still-autonomous World Court could not have survived. Ansgar Nilsson had moved fairly fast into an influential senior position on the Norwegian Nobel Committee as well, due to some mishaps that removed the senior members either by death or disabling injury. Even though he had postponed Chillingsworth’s candidacy, he could not stop the inevitable. Yet he was determined at least to make the Nobel ceremony as uncomfortable as possible for the Nobel laureate. Oslo’s Vigeland Geo-Dome, Wednesday, December 12. After perfect landings, twin state domecraft traveled forward on sliding cushions of ultrasound to the docking station. Of course, each bore the seal of state, or official World Union elephantine logo. Helmeted and shielded riot control forces locked arms in front of the railings where people waited to see the English prizewinner and world premier. Chillingsworth walked down from a domecraft--this time the one that came in first. Distinguished, white-haired Chairman Nilsson of the Norwegian Nobel Committee and other hosts had gone all out to provide a warm welcome. The world's president moved down the wide, red carpet toward the welcoming officials in his red and white cape and white miter. The chief greeter moved forward, bowing elaborately in an Oriental fashion. “Greetings, First Citizen! The king sends his warmest regards, and the Nobel Committee of Norway is most pleased to be your host at the coming events,” said Nilsson, flashing a brilliant, mocking smile. Chillingsworth nodded, said a few words of greeting from the World Union, then passed on, still without a flicker of recognition. He reached the speaker’s platform through solid walls of security guards. Dr. Chillingsworth climbed up to the podium, his bland face slightly flushed. Cheering broke out, immediately disrupted by some scuffling and disorder behind the security cor don's ranks. Mostly working-class women and their children from outside Oslo, they held up placards questioning the world premier’s policies. 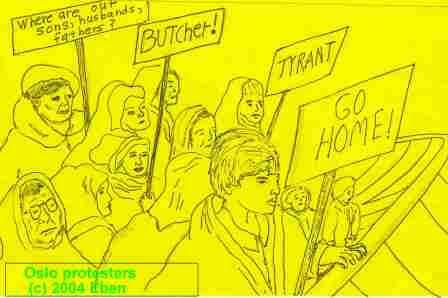 "TYRANT," "BUTCHER," and "WHERE ARE OUR SONS, HUSBANDS, FATHERS?" referring, of course, to the slave labor camps, brought a vigorous response. They were never even able to display "FIRST CITIZEN ENSLAVES THE WORLD! and "STAND UP AGAINST THE WORLD VAMPIRE CHILLINGSWORTH!" Security police rushed at the offenders who had somehow eluded the thought-scan cameras. Immediately, the women and children and their placards disappeared--along with any media representatives and their cameras in the vicinity. The Nobel laureate accepted several bouquets from Laplander boys and girls in red, embroidered blue tunics and red hats. An aide seized the possibly dangerous roses and they vanished. Chillingsworth addressed the crowd. "I wish to thank the people of Oslo, for this signal honor of welcoming me to their fair city and province on the grand occasion of the Nobel awards. But as loyal and obedient citizens, may I remind you we are doing homage today and in the following days, not to an individual, worthy as he is, but to the World Cooperative Spirit. Unfortunately, as you know, a few, ignorant and misinformed individuals, a tiny fraction of the world population, still think to resist and hinder this holy movement of the ages toward full and complete union. But today, fellow world citizens, the banquet table spread with world peace and unshakable community, we stand firmly and humbly united, hand in hand--"
“--hand in hand...” he repeated, then stopped abruptly. Air thickened in the port shed. Everything seemed to be lifted several inches before being let down. A muffled roar passed over the assembly, which quickly became deafening, like claps of thunder. A cyclonic wind next struck and blew the Nobel laureate completely off the platform. His miter sailed as far as the port shed wall far to the rear. There fell a silence, a hush more dreadful than the last events. “We’ll all be atomized!” a woman screamed, breaking the spell. Her cry was echoed by hundreds. Many ran over the platform. Others jammed the nearest exits. Amazingly, order was restored. Security forces, wielding electric prods, pushed the crowd back into position. The guest was recovered from where he was blown and restored to the platform. Aides smoothed his badly rumpled hair and clothes and a search was made for his miter. Yet he proved too rattled to start over. A further distraction was taking place. Detachments of security ran toward a domecraft. They formed a ring around the one Dr. Chillingsworth had used. When nothing more happened, Chillingsworth thought he might take up his speech where he left off. “--as we exact hate for hate, blood for blood, eye for eye, tooth for tooth, limb for limb, life for life!” A glance at the domecraft gave the speaker pause. It suddenly rocked with some sort of internal disturbance. Smoke then poured out its main hatch and rolled and writhed down the red carpeted gangplank like a great black snake. Chillingsworth's mouth fell slightly open at this sight. Port fire alarms began to wail. The second domecraft also rocked in its berth. Seats and instrument panels flew through the windows along the sides. Black clouds, bolts of flame forking out like lightning, engulfed both white spheroids and the nearest guards and police. The Nobel laureate was seized by his security aides and taken away. Almost everyone fled at the point where they had left off a few minutes before. Automatic sprinklers poured on the domecraft, but the flames grew worse. Later after the crowd and the police had cleared out, only a white-haired man was left in view, pacing back and forth. A young man dressed in Laplander costume crept out from under the platform and was about to sneak away when Nilsson blocked his path. “I know, but he is still only human. He is bound to make a misstep. When he does, we strike and strike hard! I’m still counting on our operation here to force him to run for it. Now we must leave at once or we’ll be caught in our own trap!” Nilsson said. Together they escaped the port shed before it burst into flames together with the domecraft. Thanks to spin doctors, Chillingsworth gave a greeting to Oslo and the world audience that showed no sign of any disturbances. Crowds applauded and cheered the “world peacemaker” so unrestrainedly that anchors were moved to confess they had never before seen anything like it. Somehow they even produced a Nilsson applauding madly as Chillingsworth concluded his inaugural remarks. The only problem is that the World Court leader was wearing a light blue tie in the clip and the actual color was black with blue pinstripes. An armored personnel carrier headed in a round-about fashion to the Grand Hotel. A parade for the Nobel laureate was always given in front of the hotel, and even this time there would be no exception. The world watching the event saw no sign of the catastrophic upheavals blackening major portions of Oslo's skyline and modest-sized Geo-Dome. Instead, the world's billions observed the usual gala torchlight parade decorated with bright banners. Happy, cheering thousands (in truth, merely hundreds of method actors) marched in front of the Grand Hotel. Explosions went off in the hotel, forcing Chillingsworth back to his roving carrier. As it began, so the ceremonies continued. The Peace Prize was handed to Dr. Chillingsworth by the king before a somewhat slim assembly in University Hall. People whispered and talked all during the ceremony. Ibsenites had leaked news of the domecraft explosions and claimed responsibility. Sirens went off in the building, forcing an evacuation just after Chillingsworth was awarded his Diploma and Alfred Nobel medallion. A firestorm developed from the exploding domecraft. Oslo’s dome collapsed, sealing the city’s doom, for exposed to the weather the population alternately fried in ultraviolet rays and froze to death. Whisked out of harm’s way by a secret service shuttle tunnel, Dr. Chillingsworth escaped to a third domecraft and unofficially left for London. From there he connected with a more heavily armed domecraft and flew to London. “Yes, First Citizen, you displayed the most remarkable sang-froid,” observed someone in security with the rank of a colonel. Twelve hours or not, clearly, First Citizen badly needed a change of scene and tempo. Despite Chillingsworth’s remarks, the X-P8000 was a domecraft fitted for interplanetary travel. Its nuclear engines were twice the size of the terrestrial versions. Speed, half that of light, was not quite up to star travel, but it was not designed for that anyway. Until double-safe security arrangements for the new quarkships were flying, the much slower domecraft would have to do. It went without saying that a quarkship fallen into the wrong hands would be an unmitigated catastrophe. Briefed on the way, Chillingsworth hardly knew where the time had gone when lights flashed telling him the ship was about to begin approach for docking. Like everything about Jupiter, the gas plant’s name was big: Jovian Gas Reduction-Transshipping Center 1--Synchronous Font (JGRTC1-SF). His World Excellency’s eyes blinked rapidly as he tried to take in the immensity of an object that was more star than planet. Everything about Jupiter was sovereign and majestic beyond saying, inviting large gestures, and great acts of superior men. The king and its Solar System-sized magnetosphere dwarfed anything but the Sun--a fitting venue, Chillingsworth saw at once, for the leader of a World Union that was reaching out, not only to the Solar System, but to the stars. He was only sorry now that Earth was his home planet, now that he saw Jupiter’s potential with his own eyes. But perhaps that could be changed. “Oh, shut up!” said Chillingsworth. He flicked the protocol officer’s banalities off and accepted fresh ice water from a bowing steward. He sipped and gazed at the screen and tried to take in what he saw. Pressures of up to 100 million Earth atmospheres on the surface? He liked that. 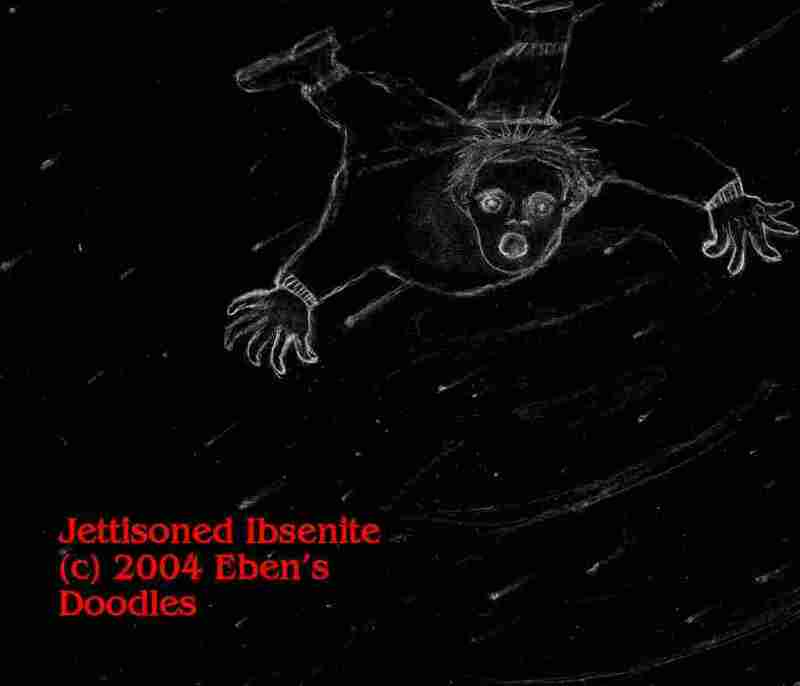 It meant Jupiter, unlike the troubled Earth, would never be contaminated by Ibsenites. Absolutely never! And as for JGRTC1-SF’s security, it seemed almost as good as they drifted in toward berth at the port alongside. He had been informed by his security chief before departure from London that the gas plant was restricted to engineers and technicians a governing board had rigorously screened with thought-scan systems. There was not the slightest possibility an Ibsenite had slipped through the security net. At last able to breathe free of Ibsenites if not his own protocol department, the vastly relieved Chillingsworth left the domecraft with his aides. A project supervisor he recognized from the image showed him on the domecraft screen greeted him. Chillingsworth wrinkled his nose at an agreeable scent. “Lime?” he inquired. “That’s a nice aroma for a gas plant. Soothing to the nerves, I suppose. Glad I thought of it.” Conducted to his quarters so that he might freshen up before dinner, he listened to “Hoffman’s Tales” and gazed out of the diamond-sheathed observation windows of his luxury suite in the bottom “topside” observation deck of JGRTC1-SF. There was much to see--the facility itself, the quarter-million-mile-round disk of the planet, the various moons, one of which was the size of Mercury, and, of course, the notorious Great Red Spot, which was three times Earth’s size--or was it four?” As he looked, it seemed larger than before, as well as glowing more fiery. His eyes began to hurt from the overload of reddish glare and unthinkable dimensions of everything that confronted him. He shook his head, but he was too tired and overwhelmed by the king of planets to ask the station Cray about it right then--a predictable effect the planet had on people seeing it for the first time. After dinner, at which he was served his favored chilled mineral water with perfectly fresh ice, Chillingsworth enjoyed the first deep sleep in many days. As Jupiter’s day spanned only 9.9 hours, he and rose nearly a full Jovian day later to a remarkably Earth-like breakfast. His PSIN informed him of a tour scheduled afterwards. Chillingsworth decided not to cancel. He wanted to see what his trillion dollars had bought the World Union. The suitably big named station master, Ponampurraramahoona, appeared promptly at the stated hour in his spotless, light green smock and booties and led the way. Like a grand spiral staircase worthy of Olympus, abode of Jupiter and the Olympian gods, the connecting, globe-like chambers stretched beyond range of the human eye. At the end, beginning a ride on the station’s spiraling “rocket lift” back down to the observation deck and his VIP suite, he congratulated the project supervisor. “You’ve done splendid work here, Dr. Pona--Pona--Ponapurina!” said the First Citizen, his eyelids flicking swiftly over the greenish, wormlike form in front of him. They stepped out on the platform leading to the observation deck. A group of top personnel and tables of refreshments waited to greet him. The CEO would have said more, but Chillingsworth’s PSIN announced that it was time for lunch. “Visitors on synchronous stations will find, “ the PSIN informed him, “it is best to partake lightly, gradually increasing the amount, since the gravity is not quite that of Earth’s and too heavy a meal tends not to set well and sometimes rises back to the point of origin. The menu is as follows...” While he listened and made his selections, Dr. Chillingsworth sat down in a throne-like gilt chair brought for him by the project director from his own office. The tour of so immense a facility, actually a floating city, had tested his endurance somewhat, though no one had to walk any distance in the station since all the steps and walkways were automated. Yet it had taken them five full hours, or half a Jovian day to go from one end to the other. But first, before he retired to his quarters, he had to write his name along with “Impressed” in the guest book situated in front of a massive piece of World Union art--a holographic tapestry depicting “THE APPROACH OF UNIVERSAL HARMONY AND PEACE THROUGH WORLD GOVERNMENT,” in which major portions of the Universe were represented by constellation and all ringed about by World Union sentries stationed on elephants. But the tapestry had a special feature. At a touch of a button any part could be enlarged. 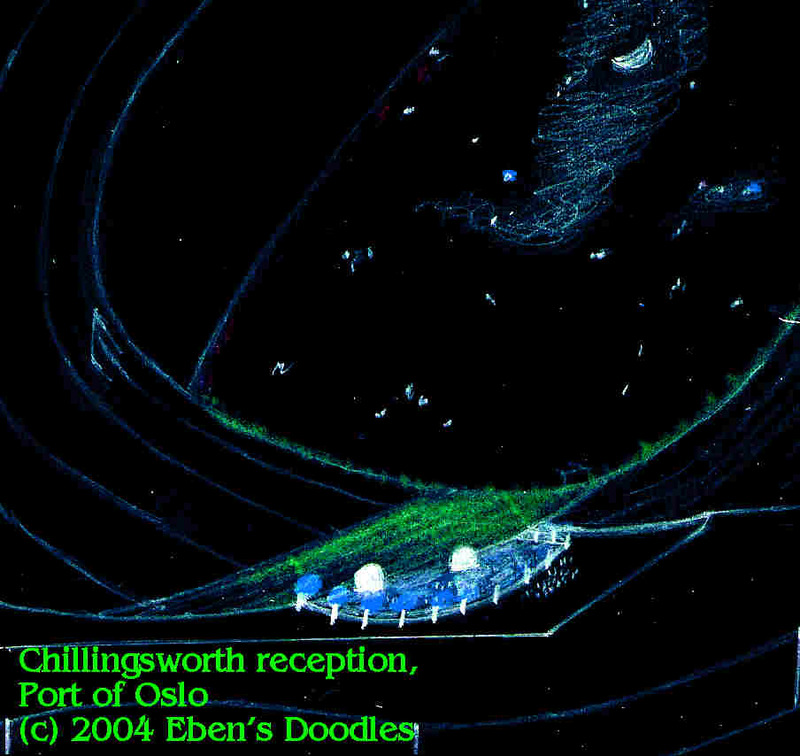 Chillingsworth pressed for the facility and it suddenly enlarged, a giant architectural model slowly revolving with the galaxy-flecked Universe in the background. At the press of another button the latest plant construction appeared--which, the CEO explained, would add another two hundred miles to the facility and include, among other things, a health complex with Olympic Games-sized running tracks, stadium, and gymnasium for as many as 50,000 new personnel. “Please, please!” protested the project manager raising his hands. He might then of bowed himself beneath the floor, but he thought of something that stopped him at Chillingsworth’s ankles. “We owe it all to First Citizen! But there is something else that may interest you.” Stepping to a screened computer link in the wall, he contacted the Crisis Control Center (CCC)--which handled Class A-Extraordinary Emergency Engagements (CA-EEEs) for the facility--that is, problems too complex and sudden for human intelligence to apprehend and control. The Cray supercomputer in control gave them a briefing on its functions, as well as listing the various possible crises, beginning with hull compromise due to a mis-docking incident by a domecraft or tanker down to radio emissions from the Great Red Spot. “Complete termination,” the CCC Cray responded, instantly showing a mock-termination of the facility from the collapse of the hull to the explosions and fireballs as it plunged into impossible temperatures and pressures of the lower atmosphere. “How exactly?” the First Citizen wanted to know. “Decay of the synchronous position through disruption of the fixed orbital coordinates. The coordinates for the fixed orbit are--” The Cray began rattling off an impossibly long figure. The project CEO bowed himself out, walking backwards from Dr. Chillingsworth’s presence as if he were a great maharajah of the Bengali. If not dismissed so abruptly, “Dr. P,” to put his master’s fears to rest forever, would have shown the crowning jewel of the facility’s protective security system--the particular warning device able to measure to the width of an electron any deviation in the position of JGRC1-GF. The instant a deviation was detected, lights would flash a red alert throughout the facility. Contained in four feet of lead, covered with synthetic diamond, the unit was impervious to cosmic rays and any other form of interference. No one who had seen it expressed the least doubt afterwards--not the least. Earthside, it was the end of the Norwegian contribution to the Nobel awards, but a Chillingsworth double carried on for him in Stockholm and no one seemed to suspect. Swedes, not to be outdone by fellow Scandinavians, went all out to please the Nobel laureate with a banquet and awards in the Golden Hall of the municipal building. Beneath City Hall’s mosaic splendor of the enthroned Queen of Lake Malaren, mythical patroness of Stockholm, Chillingsworth was awarded the four remaining prizes, including the one for literature though as yet he had not published anything. The news created the expected sensation. The press asked about his plans and future activities. Jupiter--5:00 p.m. Earth Time, Jovian Noon. Though a working, huffing and puffing gas plant lit round the clock with hissing gas flares would not seem to be the ideal retreat for a head of world state, it proved most suitable for a man in his circumstances. Safe in his impregnable refuge high in Jupiter’s chemical and gas-rich atmosphere, Chillingsworth was glad he had come. He lay back relaxed on a sofa composed, except for the frame, of ultra-sound after enjoying another excellent meal--a thick, red beefsteak, followed by kidney pie and pudding, all concocted ingeniously of algae. For entertainment he had a huge screen and an orchestra playing his old favorite “Tales of Hoffman” or some other symphony of his choice. When that tired him he could gaze out through several feet thick of diamond shield at ever-changing spectacle of Jovian clouds and terrain. At the moment he was admiring a giant, interplanetary tanker positioning itself at an Everest-sized valve. Loaded with processed gas compounds, it would transport them in frozen state to geosynchronous food factories ringing Earth. Part would be turned into food production, the rest sent down to Earth for energy consumption and a myriad of industrial applications. No project manager, however big the project, would dare presume to call him that. Chillingsworth’s eyes shot open and began blinking rapidly. A white-haired, old man stood before him. “I won’t stand for this. The interview is over! Get out!” Chillingsworth rose and reached for an alert button beside the sofa. He pressed it. Nothing happened. There was supposed to be a siren at least, then the guards would come running. But where were they? Showing a flicker of doubt and anxiety, he looked about, but the hallway leading from the observation room was dark. Even the guard dogs--which Chillingsworth thought unnecessary at such an inaccessible site--made no sound. He started for the hallway, which led to his suite’s guard post and security scanning videos. Nilsson gave a sign and a young woman, carrying a thought-weapon, stepped out and blocked his escape. Chillingsworth flung the interlink to the floor. “I’ll not do it! You’ll never force me!” he cried like a sulking, petulant child. “Foolish words for a general without an army to protect him,” said Nilsson. Chillingsworth moved again toward the hallway, but the woman held up the thought-weapon, and he paused and seemed to re-consider. Chillingsworth’s face went pale and he wavered on his feet. He could not go forward or backward. Chillingsworth quickly rattled off a warning code in alpha-numeric. Nilsson lunged and ripped the interlink out of Chillingsworth’s hand. Chillingsworth grabbed Nilsson. They fell on the sofa and rolled to the floor. The interlink was in Chillingsworth’s hand again after he smashed Nilsson in the face with his foot. But he had no chance to add to what he had already transmitted, for Nilsson threw himself on Chillingsworth, wrenching both his arms back. They rolled again on the floor. Gasping, pouring blood from his nose, Nilsson was on top Chillingsworth, who gripped Nilsson’s throat, throttling him. Then Nilsson was throttling Chillingsworth. Both grew ashen-faced and utterly exhausted, but neither would let go until the other was finished and they gnashed teeth at each other. Finally, with a pitiful groan Chillingsworth slumped and Nilsson let go. The moment he did Chillingsworth bashed Nilsson’s face with his knee, which broke Nilsson’s jaw. Nilsson rolled away on the floor and lay still--looking not so much now like a tiger but a broken rag doll of a man. Chillingsworth rose slowly, painfully, but he got to his feet again without aid and looked at the woman who was still at her post guarding the only exit out--a secret port and shuttle that would operate only on Chillingsworth’s voice. He started toward her. He continued. “It can’t possibly hurt me!” he taunted. Under orders, she could only obey and targeted him. The dish spun, locked on, and the first axial tomographical scan struck. Then the second emission hit the target. For a moment it look like they had lost Nilsson too. He slumped and all the life seemed to have fled his body. Gradually, the color came back--what there was of color in his face. “You mean we came all the way here for another wretched clone? Where is the monster anyway?” groaned Nilsson. “He’s got the heads of a Hydra and the body of an eel! Coming here was an utter waste of time and effort!” He had no time to think about it. Dr. Ponampurraramahoona broke through the group huddled around Nilsson. He was waving his arms and shaking his head, he was so frantic. “Where is His Majesty? Where is he? He must leave at once! At once!” He paused, seeing Nilsson and his team for the first time. “Who are you gentlemen? Where is the First Citizen? There has been a most massive radio emission from the surface, from the Great Red Spot. And somehow we have moved so that we are in position to receive significant damage. I don’t know what--” Before he could explain they all heard tremendous groanings in the structure around them, and the clouds began racing upwards before the observation windows. The security system sounded and lights flashed a very tardy red Watchcon-1 Alert. “What is this? The operational systems are wiped out! We’ve lost elevation--we’re headed down!” cried Ponampurraramahoona. “Unless we find the First Citizen and get him off immediately, the pressure locks on the port door won’t work! We’ll try and hold it together until he’s gone, but we must find him! We must find him quickly very!” The project CEO rushed off, the hems of his smock flapping. Seconds later, with explosive charges bursting the doors before them, the dragon ship carrying Nilsson shot free of the doomed JGRTC1-GF and fired upwards. Madly twirling, the plant’s double helix flew rapidly toward the shuttle screen’s terminal range of magnification. All silent, the Ibsenite team watched the giant station’s death throes as it hurtled toward the Great Red Spot, right on target. Trailing a flaming tail, it plunged downwards out of sight, into unimaginable pressures. Then the station was gone, vanished into the Spot. Nothing remained. It was as if it had never existed. Nilsson’s guards dragged the young man away, right through his own spilled algae-chicken soup, to the airlock of a baggage ejection port. To his credit, he did not beg for mercy as he was ejected into eternal orbit around Jupiter. A moment later he fried crisp and black in the King of Planet's magnetic field. To Nilsson’s credit, he had second thoughts--though they seemed to come too late these days to affect the momentum of events significantly. Five minutes after the “baggage” was ejected, he dropped his own bowl of soup on the floor. “What’s the matter, chief?” he was asked. Far distant from Nilsson’s near hit on Chillingsworth, in Southern California, Dr. Franklin Tozier-Dillard of the Jet Propulsion Laboratory went over some latest data on Jupiter. He had to recheck it, since it wasn’t what he had received several days before. “Can’t be!” he thought. If true, it was worse than the decline in the magnetic field and low, dangerous levels of the Earth’s base frequency--levels that could precipitate a major shift of the magnetic poles. After all, a magnetic cataclysm would affect only one planet, albeit Planet Earth. He booted up Jupiter on his console and sat looking at the king of planets for a moment. According to his data, it had moved--was moving toward the inner planets. A slight degree, to be sure, but the shrinking orbit of such a colossal object made even a slight degree extremely momentous in the matter of astronomical repercussions. Moreover, its electromagnetic field, the magnetosphere, engulfed half the Solar System--a system that was almost mind-numbing in extent and power. 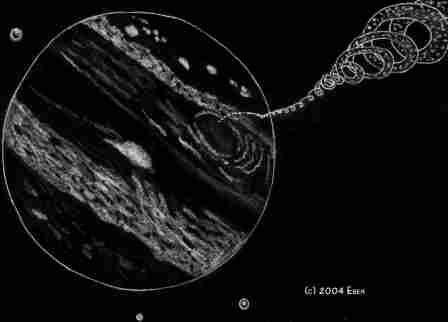 The electro-magnetic charge Jupiter generated was so tremendous it fried its own moons, which were the size of the Inner Planets. Jupiter’s shift of its orbit toward the inner planets was so momentous, in fact, he decided to address the next meeting of the Provincial (formerly “Royal British”) Astronomical Society of Great Britain. Later, at home, he lay awake thinking about the Jovian movement toward Earth. Was it possible, he wondered, that it might continue toward the Sun, colliding with or merely “electric-chairing” each of the inner planets in turn before converging with the Sun, the one object with which it most compared? What then? Would the Sun’s gravitational forces draw off immense quantities of Jovian gases and expand to the point where a supernova was ignited? That, he knew, was all that was needed to do it. Though accustomed to looking at objects and events in terms of light-years and geological age, Dr. Tozier-Dillard slept little and badly that night. 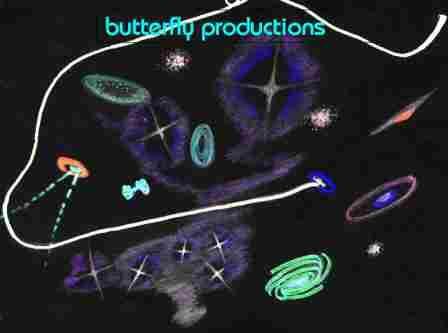 The eminent astronomer was not all consoled that he knew a catastrophic scenario worthy of Gotterdammerung, a Solar System-wide finale that would not take place for several hundred years at the earliest.